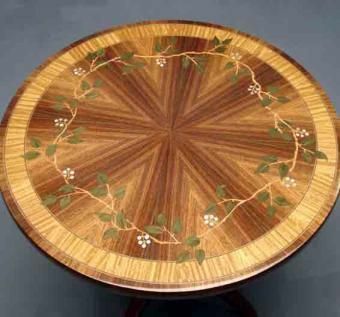 This table is made with an inlaid vine and berry motif. 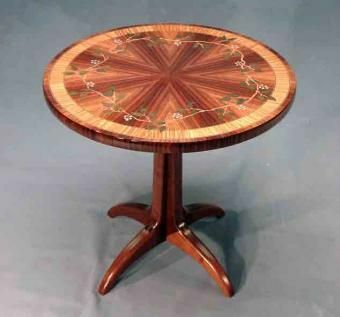 The table pictured is one of a matched pair. The berries are mother of pearl. 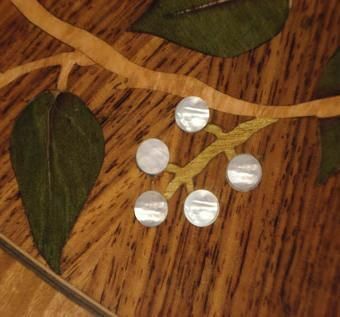 Other materials are East Indian Rosewood, Satinwood, Maple Burl, Walnut, and dyed veneers. They are finished with a catalyzed lacquer. This pair is one-of-a-kind! SPECIAL OFFER: $500 FOR ONE TABLE INCLUDING SHIPPING. BUY ONE AND GET THE SECOND ONE FOR $400.